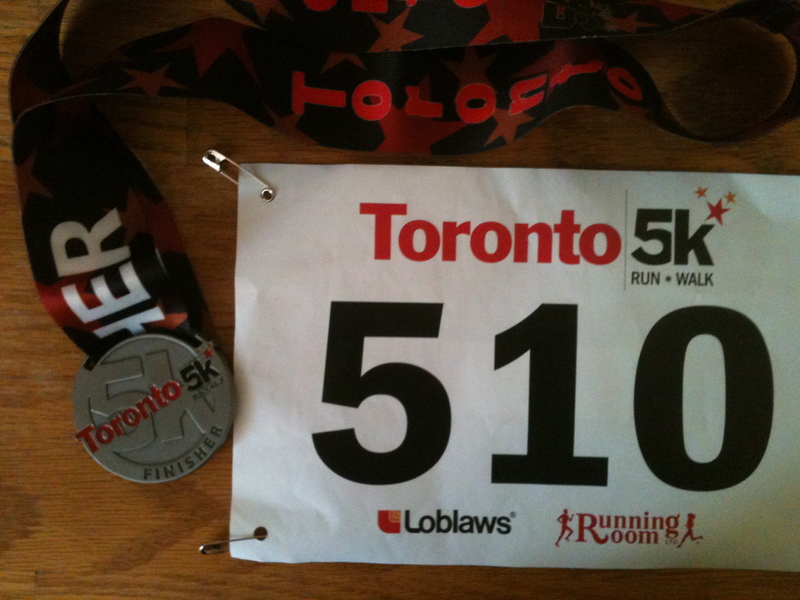 On Sunday, I closed off the 2012 race season with my 10th race of the year, the Tannenbaum 10k in the Beaches. I won’t beat around the bush: I crushed it. Earned a new 10k PB with a time of 53:17. That’s over a minute faster than my previous PB at the Sporting Life 10k in May – the race that’s famous for its almost entirely downhill route. This was my third year in a row running Tannenbaum. I can’t get over how much it has grown in such a short time. 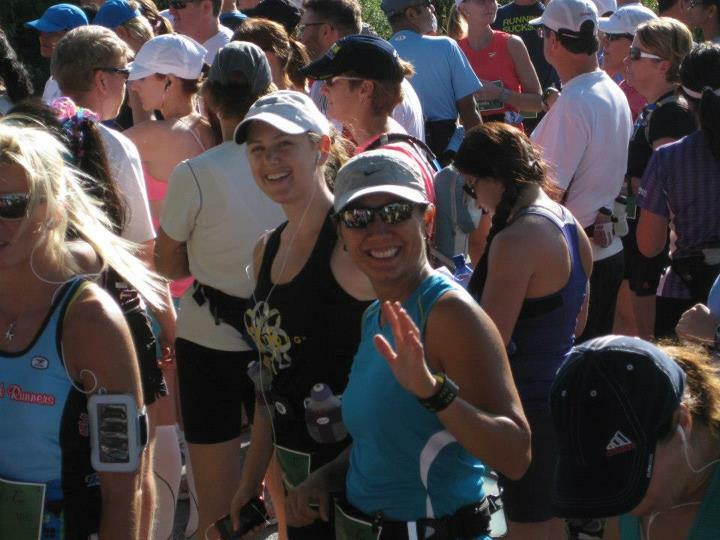 When I ran it in 2010, there were about 200 runners. 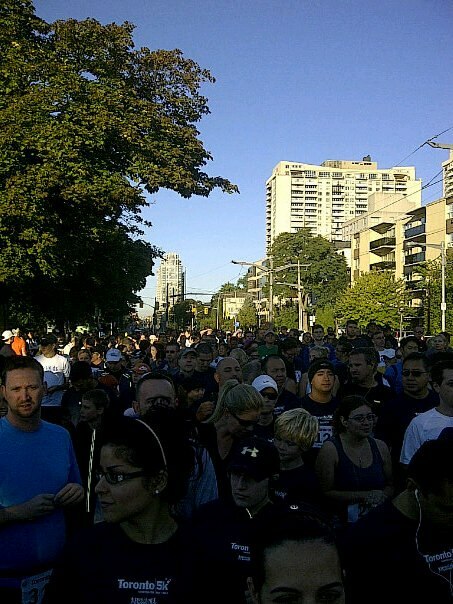 Just two years later, over 600 people registered and just under 500 ran. The race is getting crazy popular – love it. Anyway. I met Lynne beforehand and we started out together, but given the size of the race, it was pretty congested for the first kilometre and I quickly lost track of her. 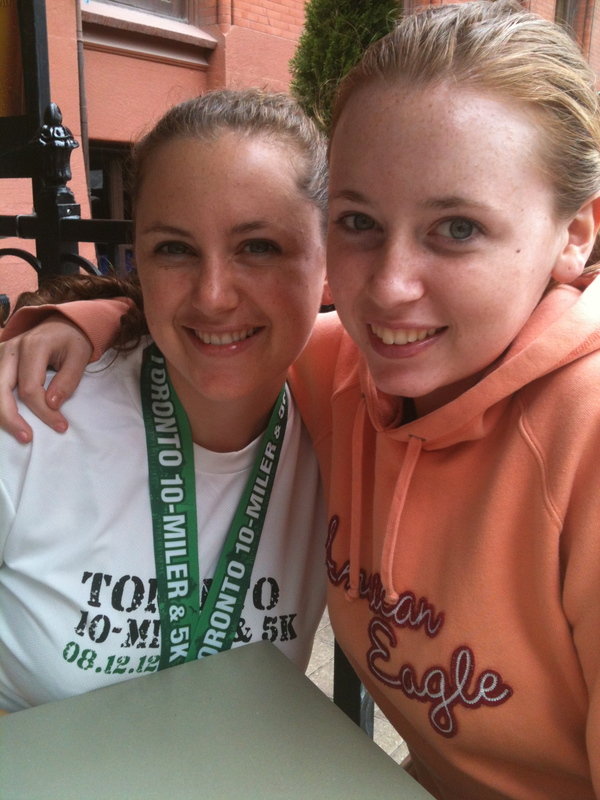 However, my friend Miranda caught up to me around the 1k marker and stuck just behind me for the entire race. That is, until 9k when she picked up the pace until the finish line. Major props to her for this feat; I was totally out of gas by that point. 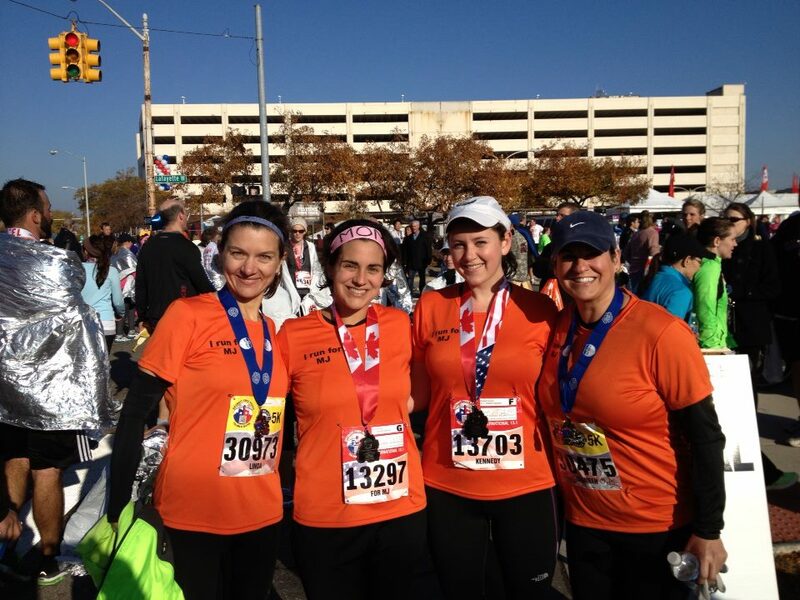 You can check out her take on Tannenbaum by reading her race recap. Aside from my PB, I had another pretty cool ‘first’ at this race. It was my first time EVER (not just in a race) running 10k straight without stopping. Those who know me know I’m a firm believer in the Running Room’s 10&1 strategy. 10 minutes running, 1 minute walking. I don’t abide by that rule when running 5k races or doing shorter distances during training, but I’ve never gone a full 10k without AT LEAST stopping at water stations. I was pretty psyched when I realized I could keep up my pace, which hovered around 5:10/km, for the entire race. Woot. A few weekends back, I traveled to Detroit for two awesome reasons. One: to run a half-marathon. And two: to visit my beautiful friend Najette and her family. And the most awesome part? We were all running together, in memory of her mother who passed away earlier this year of cancer. Melinda (MJ) was diagnosed with a rare form known as primary peritoneal cancer (PPC). The lack of awareness of this type of cancer is frustrating. That’s why Najette, her sisters, her brother-in-law and several other family friends ran this race – in memory of MJ and to raise awareness about this type of cancer that is still widely unknown amongst the general population. It was my honour to be able to join them. After a series of unfortunate events, including a ridiculous bumper-to-bumper traffic jam getting off the highway at 6:15 a.m. and our friend Vincenza’s car battery crapping out during said traffic jam, Naj and I somehow made it to the start line before all of the corrals had crossed. We jumped in, snapped a quick photo, and we were off. Naj and I stuck together for the first 7k or so. Luckily, my stuffy nose and head cold weren’t slowing me down too much and I was able to pick up the pace a bit at this point. Getting to watch the sunrise as we crossed the bridge into Windsor. That was pretty awesome. Crossing the Canada-U.S. border not once, but twice. Ambassador Bridge from Detroit to Windsor, and through the tunnel back into Detroit. The super enthusiastic crowd that seemed to never let up through the entire route. The weather. It was perfect. Sunny and calm. Cool but not cold. I wore my homemade ‘sleeves’ a.k.a old socks to start but ditched them within the first few kms. Mile markers vs. km markers. Having run most of my races using the metric system, I thought this might throw me off my game. Turns out, it’s sort of nice not to know exactly how far 8 miles is in km’s. The signs took longer to get to, but there were also a lot fewer of them. Of course if I was ever curious, all I had to do was look at the distance setting on my watch. Which I did do. And I was usually psyched that I was closer to the finish than I thought. Post-race hugs and laughs with Naj, Yasmeen & Vincenza, after finally spotting them while wandering around without a cell phone amongst hundreds of strangers. Soaking our tired muscles in Naj’s sister’s hot tub in the sunshine. Bliss. Thanks Detroit, Najette & family for making this race one of the most memorable ones yet. It’s September. 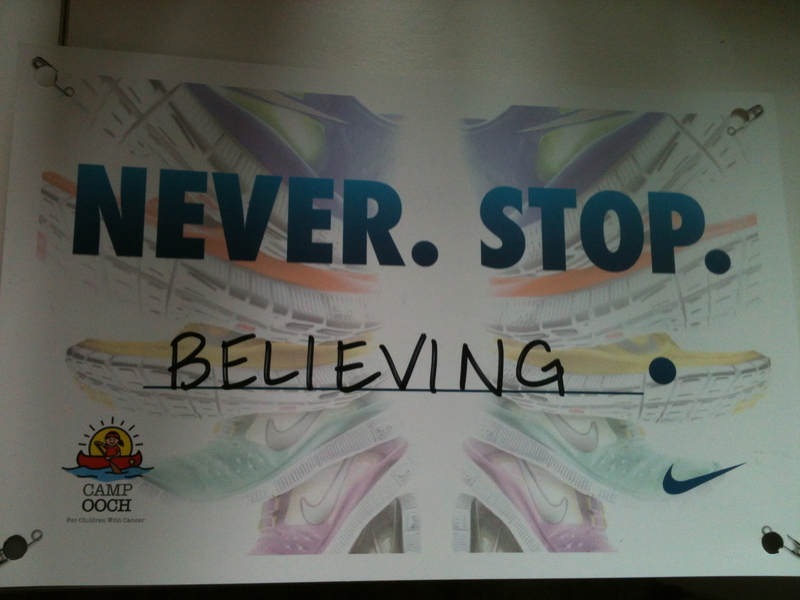 And if you’re a runner, you know what that means. Fall race season has arrived! 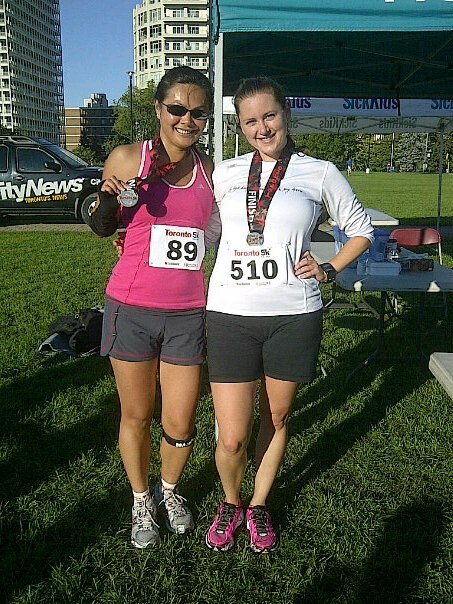 Yesterday, Lynne and I kicked our season off with a rare 5k – the Toronto 5k for Sick Kids. 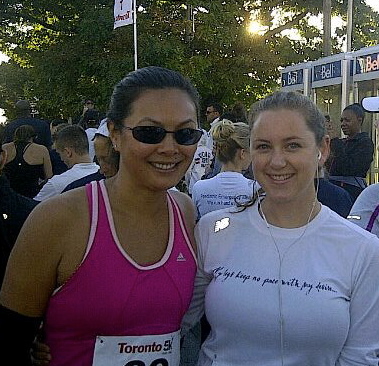 This is one of Toronto’s newest races – we ran the inaugural run last year. This time, they tripled the number of registrants and had over 400 finishers. Just like last year, it was a very well organized event. Not a lot of frills. They gave out the exact same shirts and medals as last year – but I figure that means they just had lots of extras from last year’s small turnout. That also means less money spent on that stuff and (hopefully) more money going to the cause. 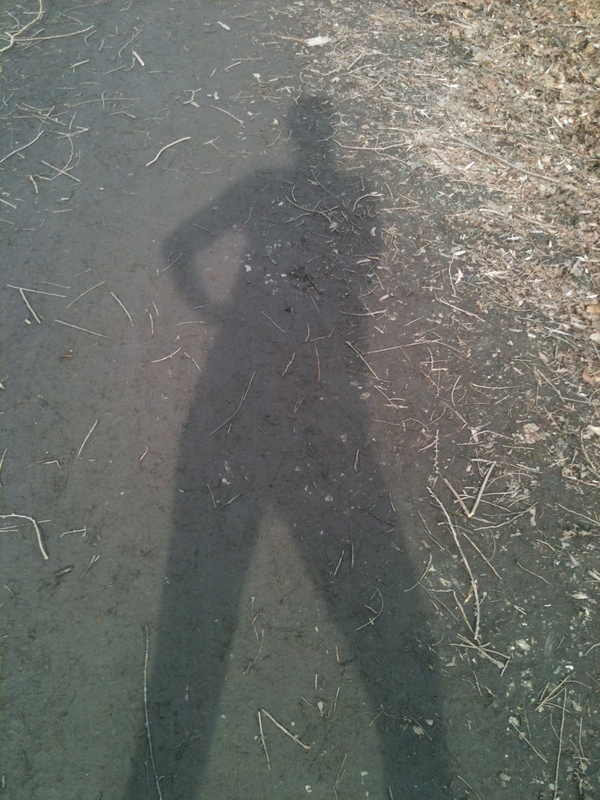 It was a gorgeous morning for a run – sunny and cool. Weather truly does have such an impact on a race. Not just in terms of logistics (rain = extra gear to pack and wear, fewer parking spots, etc.) and performance (humidex warnings/high winds/ice and snow = no PB for you)… but also in my overall attitude. When I wake up to sunshine on race morning, I’m a happy girl. I’m ready to crush it. If the sky threatens rain, I’m dragging and tired, even if I had the world’s best sleep the night before (yeah, right). So, yeah. On Saturday, I was definitely in the mood to set a new PB. And I won’t beat around the bush…. I did, indeed, crush this 5k. Started out strong on the downhill – my time for the first km was 4:32. Yeesh. No way I could keep that pace up for very long. The next few km’s were pretty flat and I set into a nice steady pace between 5:11 and 5:13. Then, right after 3k I hit the hill at Dupont/Christie. This hill felt far harder during last year’s race. It slowed me down, sure, but I definitely didn’t feel as winded (thanks, summer hill training!). Time for km 4 was 5:44. The last stretch of the race is tricky – you can see the finish area (but not the exact finish line) the whole time, and at first you’re running downhill. 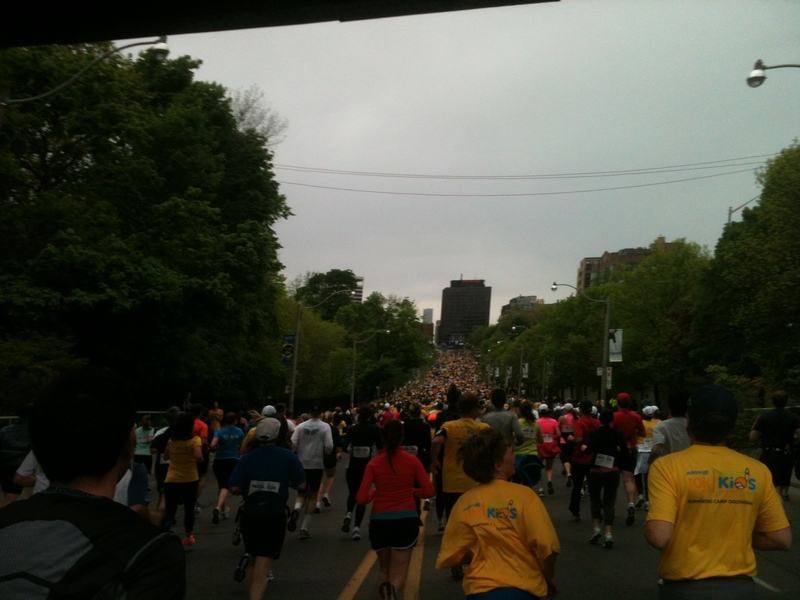 Then, as you approach Spadina Rd., you hit the incline, and it doesn’t stop so you finish the race running uphill. This makes it particularly tough to sprint. It hurt, but I pushed through and finished my last km strong in 5:00 even. 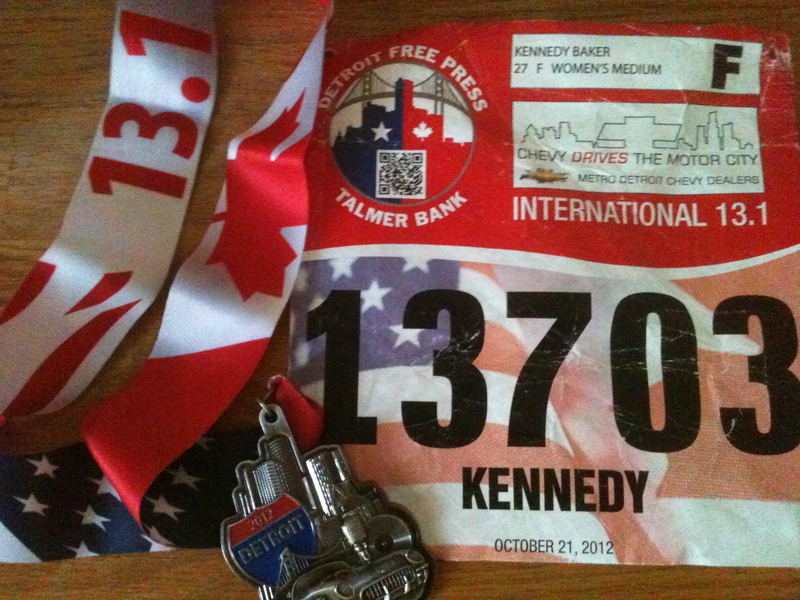 My overall goal for the race was to beat my 2011 time (26:30), but my “best” goal was to finish in under 26 minutes. My official chip time? 25:59.2. Just barely made it, but it counts! Afterwards, Lynne and I celebrated with brunch at The Stockyards. 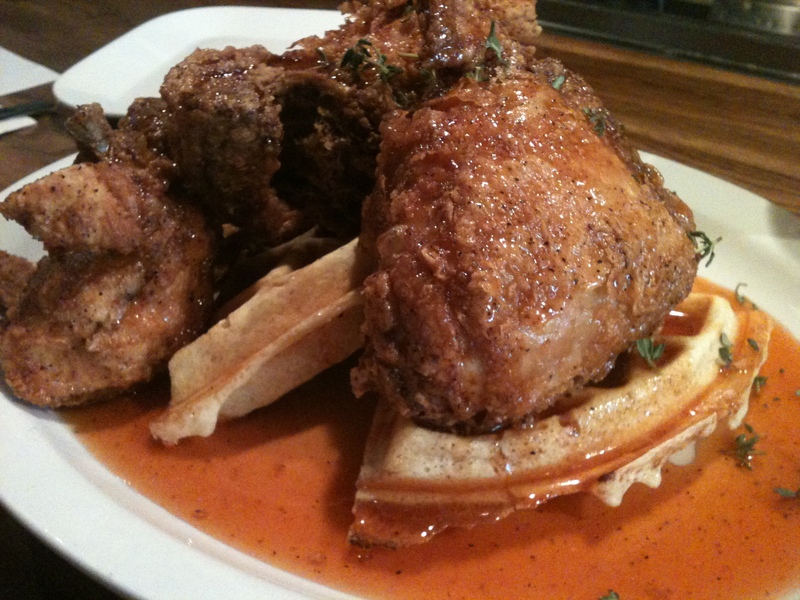 This place is famous for their “fried chicken and waffles.” I don’t love fried chicken, and I really wanted eggs. 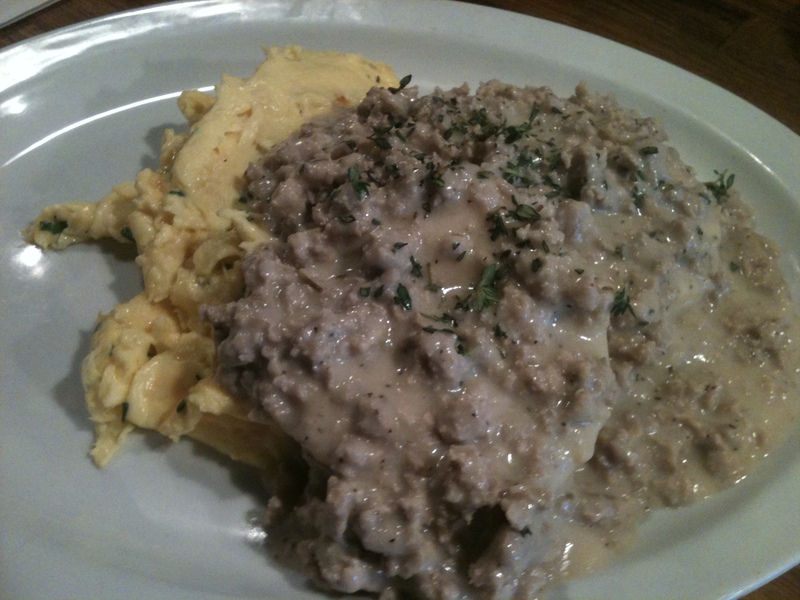 So I let Lynne get their signature dish, while I ordered the biscuits with sausage gravy and scrambled eggs. 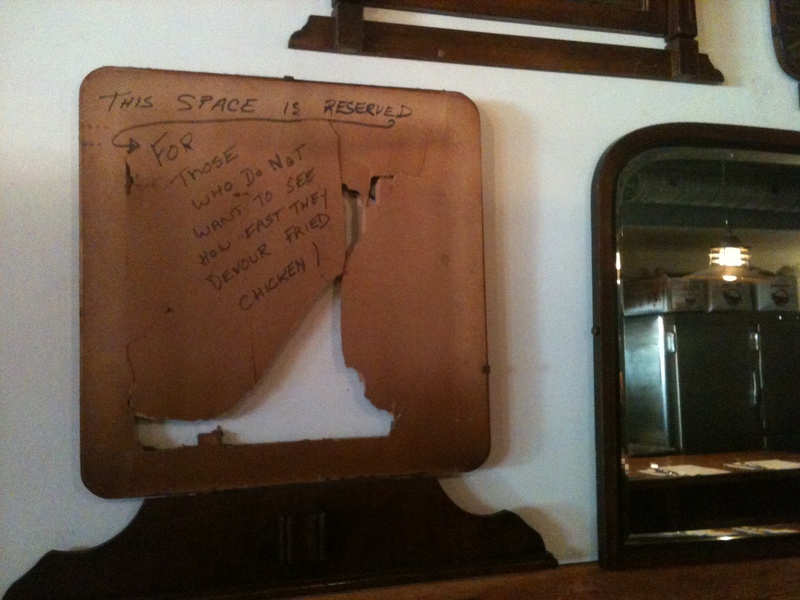 Sign reads: “This space is reserved for people who don’t want to see how fast they devour fried chicken.” I like your sense of humour, Stockyards. We shared the two meals, both of which – as you can tell – were massive. In order to “earn” this breakfast, we should have run at least a half marathon. BUT, we had another occasion to celebrate: Lynne’s birthday! So we figured that made it okay. 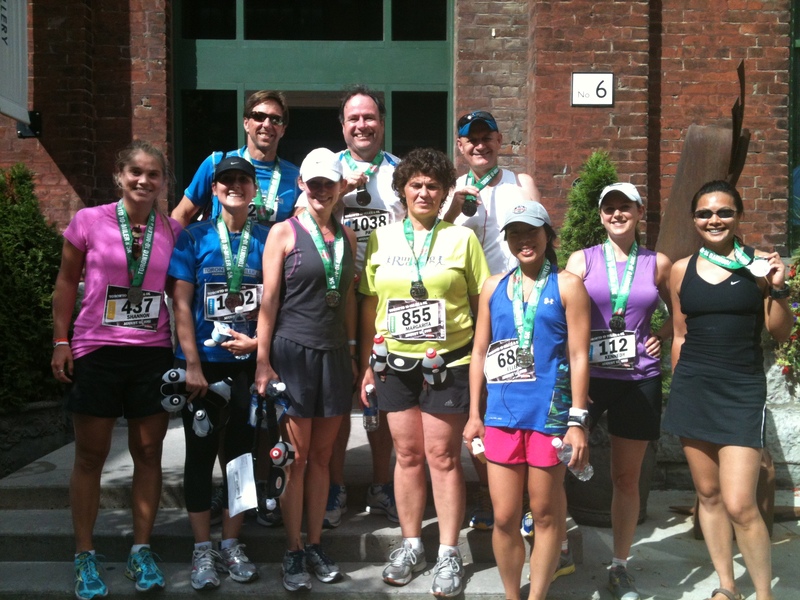 Next up: Detroit Half Marathon with Najette & Co. on Oct. 21st. So pumped for this one! Happy running and racing, friends. So I’m finally returning to the blog after another long hiatus… can you guess what’s brought me back this time?? Yeah, it’s another race recap. To be more accurate, it’s a DOUBLE race recap. That’s right. 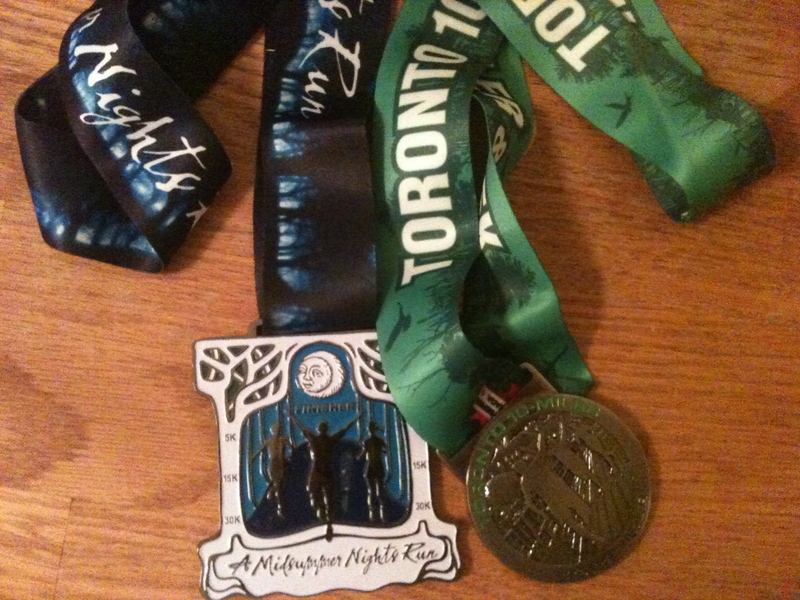 Over the last week, I ran two races: the Toronto 10-miler (16.1km) last Sunday and the Midsummer Night’s Run (30km) this past Saturday night. This was the goal race of the Running Room clinic I’ve been coaching since late May, so I had some extra running buddies. It was so great to see them do so well after months of training in the crazy hot summer we’ve had. These guys worked HARD and they proved it at the race – all of them beat their goals and finished strong. Speaking of goals… I happened to beat my time from last year at this race by 4 minutes and set a new PB, finishing in 1:32:42. So I was pretty psyched, too. Weather was cool to start, but got really hot with the sun and no shade on the entire route through Tommy Thompson Park & the Leslie St. Spit. A nice flat course though, so I wasn’t complaining. 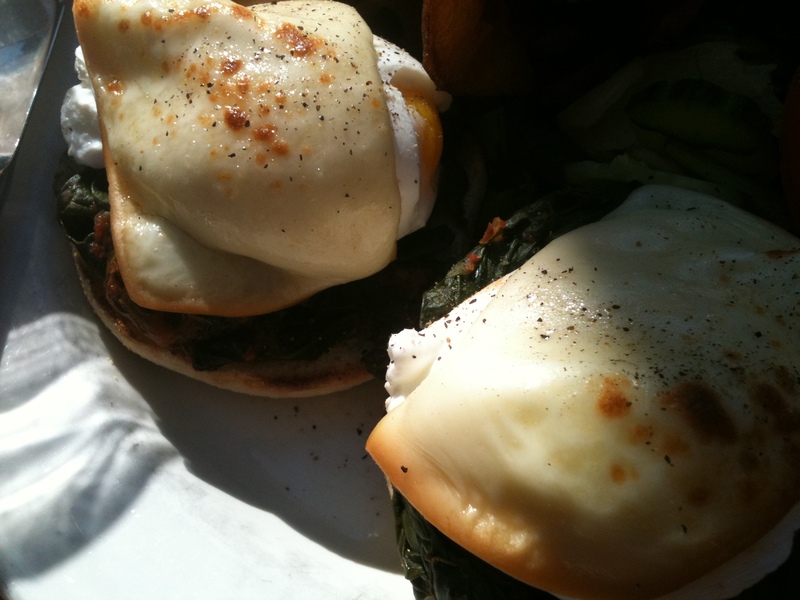 After the race, Lynne, Madi and I headed to the Flat Iron for eggs Benny, Caesars and mimosas. And beer. Hey, we both had new PBs to celebrate. With one race down, I started focusing on/worrying about Midsummer. Why worry, you ask? Well… all summer I’ve been running with my 10-milers, 3 times a week. I haven’t had all that much time to follow a training plan that would have me in top shape to run a race almost twice that distance a week later. I managed to squeeze in some extra miles before – and after – my group’s 7k taper run a few weeks ago, for a total of 23k. It wasn’t too painful so I figured I could swing it, knowing the last few km of the race would probably be quite painful… albeit temporary. This was my first time running Midsummer, my second time running the 30k distance, and my first time running an evening race. Lots of challenges present themselves in this kind of situation…. the biggest of which is this: what/how much/when do you eat? So many more opportunities for GI issues when you have to consume more than a bowl of oatmeal. I had my usual bowl of oats for breakfast. 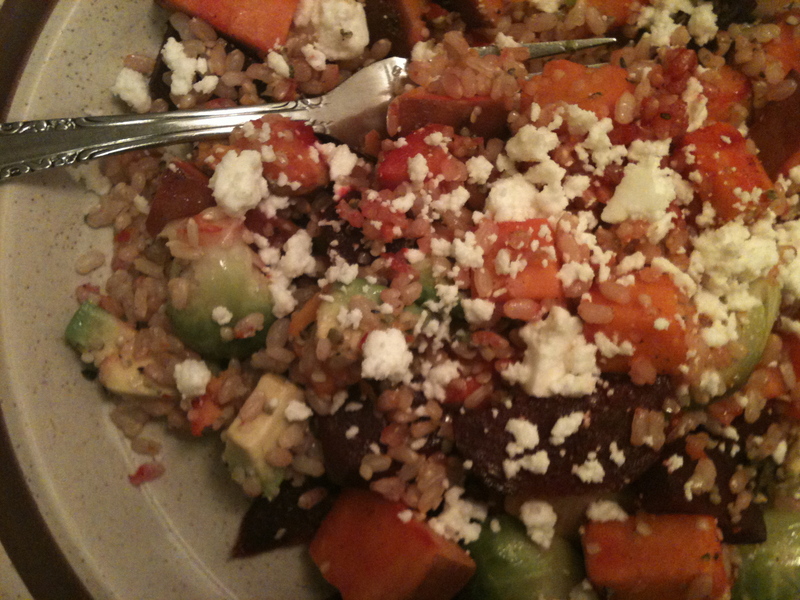 At lunch, I had leftovers from dinner the previous night: brown rice + starchy roasted vegetables (sweet potatoes, beets, Brussels sprouts) with hemp seeds, goat cheese and avocado. Loved this combo. So good, heavy enough on the carbs, but still easy to digest. Later in the afternoon I had an apple, and a little over an hour before start time, a LaraBar. I felt a little concerned about things after the apple, weirdly. But all worked out okay and I was feeling fine when we lined up at 5:30. 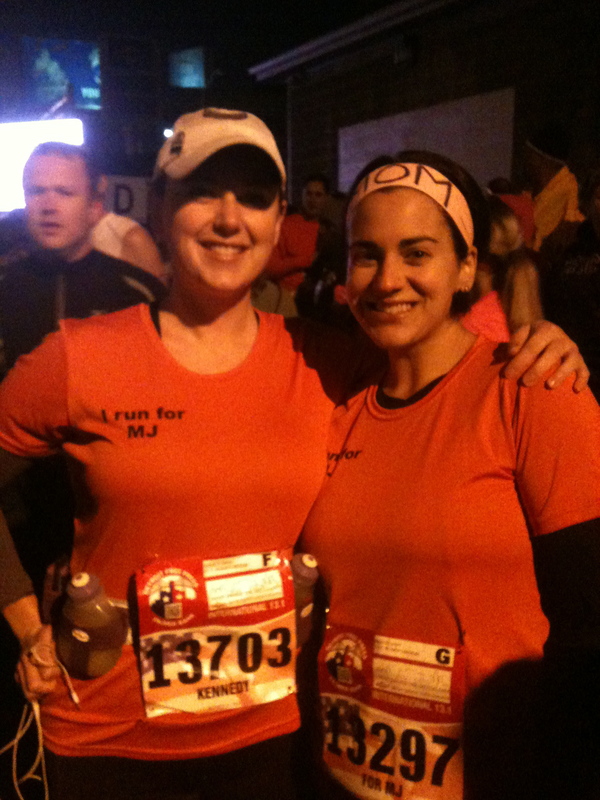 Elaine and I were doing the 30k… and Lynne was doing the 15k, which started at 6:45. She came early to see us off and snap some photos. I started the race near the 3 hour walk/run pace bunny, figuring I’d see how they paced but probably drop back from them pretty quickly (last time I did a 30k, I stuck with the 3 hour pace bunny for the first 10k and regretted it afterwards when I ran out of steam at 20k). But I kept checking in with myself and I was a bit surprised that I was feeling good at their pace of 5:30. 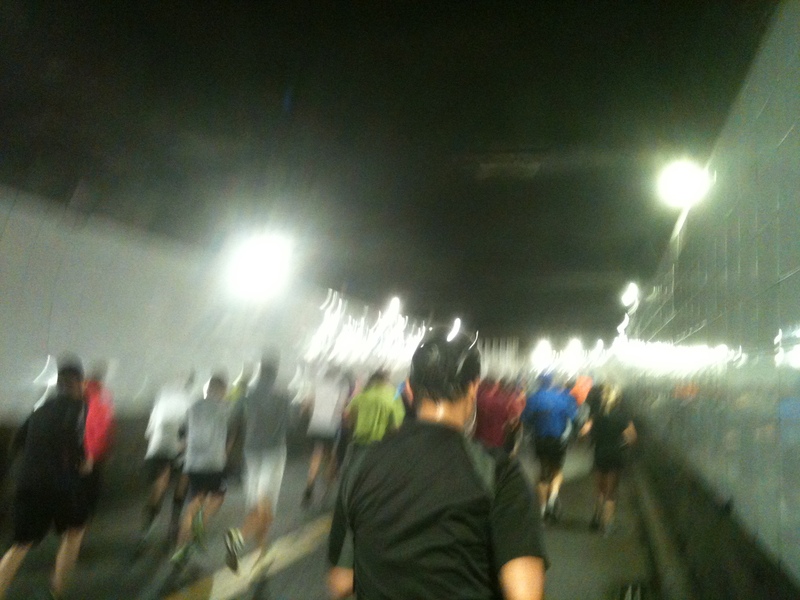 I ended up getting ahead of them around 6 or 7k, somehow, and didn’t see them again until after the 26k mark. At that point, I was kind of pissed that they were passing me, but I was totally running out of gas and just couldn’t keep their pace. I was thirsty and my legs were heavy. I was out of electrolytes and gels. I just wanted to be done. But I’ll honestly say that up until about 24k, I was enjoying myself. Felt strong. The route was nice. And the temperature was cooling off quickly, especially after the sun went down. Ideal running conditions, really. I crossed the finish with a time of 3:00:47. I went out just hoping to beat my time from March – 3:13 and change. I would have been happy with 3:10, so obviously I was ecstatic with my just-over-3-hour finish. I’m sure I have proper hill training, track workouts and many scorchingly humid runs to thank for my speedier time. Once we got our medals, water bottles and bananas, it was time to get changed and hit up the beer garden. 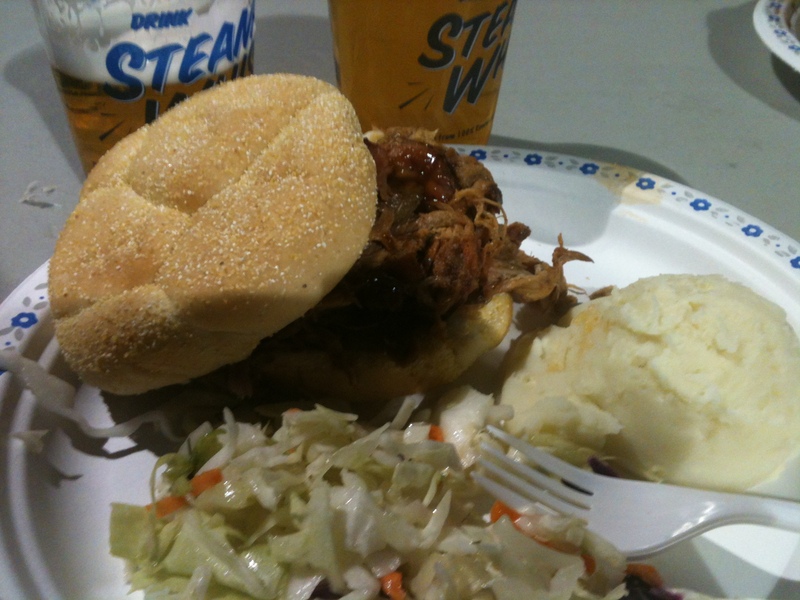 Pulled pork sandwiches and Steamwhistle beer was pretty much my reason to keep running during that last 6k! I didn’t realize it until today, but last night also marked my 20th race. THAT seems crazy to me… it still feels like that Egg Nog Jog back in 2009 wasn’t so long ago. Anyway, two PBs in one week… yep, I’ll take that. Until the next race, friends! Hello, long-lost readers! I trust you’re all keeping well. As you can tell by the title of my last post, I didn’t exactly complete the 30 Day Photo Challenge. Life got crazy, the camera on my phone crapped out for a few days, and then I just lost momentum. I did love the concept though. Will probably give it a whirl again in the future. It’s the return of the race recap!!! Yesterday, I ran the Sporting Life 10k. 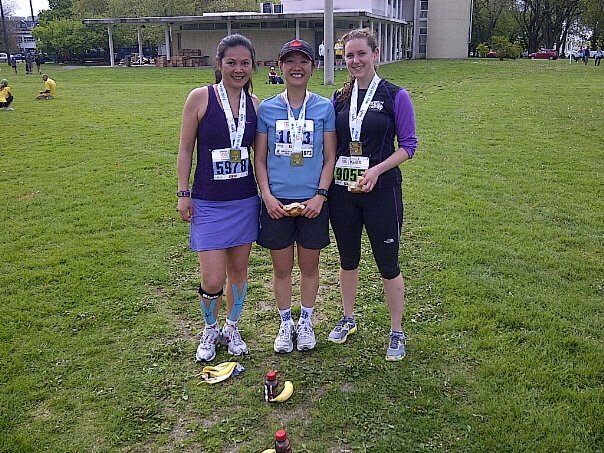 It was my third race in 2012 (I also ran a 5k and my first ever 30k in March), so I thought it was high time to write a recap. The race had its fair share of memorable moments. Why don’t we start with the fact that I overslept? No, that is an understatement. I awoke 30 minutes before the gun went off. And I STILL made it. How, you ask? 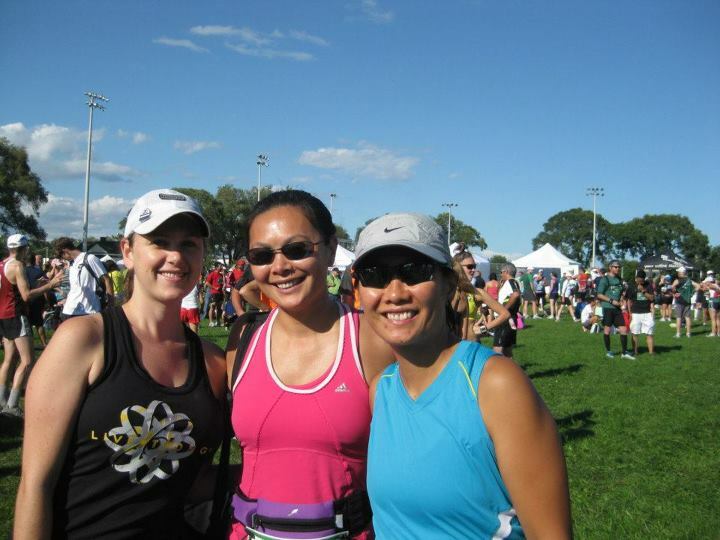 Because I have straight-up awesome, rock star running friends. Usually, my race morning routine looks something like this: Wake up 2+ hours before the race. Eat a bowl of rolled oats. Check the weather forecast. Drink lots of water. Go to the bathroom (several times). Get dressed according to forecast. Pack my bag. Double-check that I have everything I need. Head out to meet my race buddies at baggage check. Yesterday, it looked like this: Wake up almost 2 hours late. Let out a frustrated groan. Text my friend Lynne that I slept in and wouldn’t be able to make it in time. Curse. Answer Lynne’s phone call saying she was 5 minutes away with Elaine and their friend Steve and they were picking me up. Hang up. Run around like a crazy person getting dressed and packing my gear. Throw two pieces of bread with almond butter together to eat in the car. Run out the door. Somehow, we parked, went to the washroom, and snuck into the line at 8:08 a.m., with two minutes to spare before our corral was released. I got a stitch in my side almost immediately – surely due to wolfing down my breakfast 20 minutes earlier. Curses! The weather was overcast and cool, with a sprinkling of rain as we crossed the start line. I wasn’t planning on rain, but it turned out to be kind of nice as it kept me cool through the race. The route was awesome – straight down Yonge St. from just north of Eglinton down to Richmond, where we headed west to end up at Fort York. That meant it was mostly downhill, with a few small climbs, until the 7k point. When we picked up our race kits last week, we received these stickers and were asked to fill them out and stick them on the back of our shirts as we ran – then stick them on a wall at the finish. 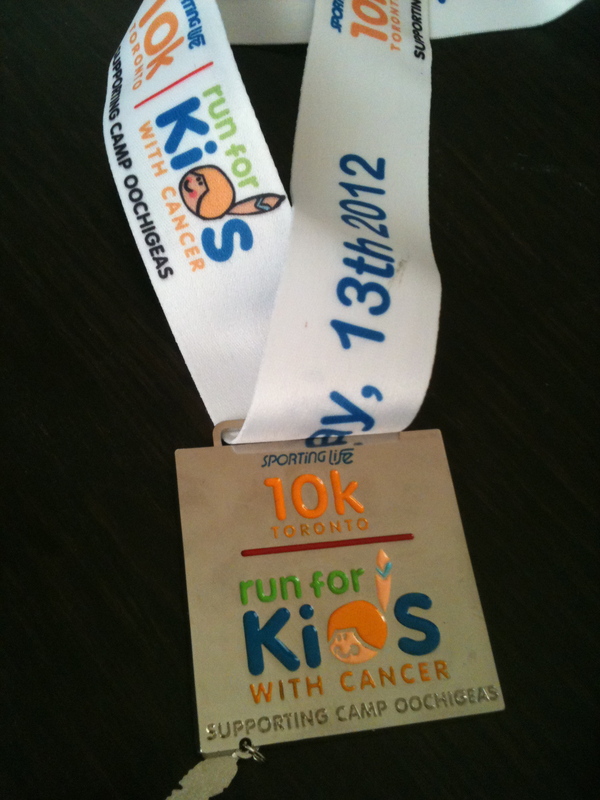 Each sticker equaled $1 in donations to the race charity, Camp Ooch, which is a camp for kids with cancer. Wonderful cause. The side stitch started coming back around the 9km mark, but I toughed it out, knowing the pain would be over soon. I crossed the finish with some confusion about the clocks. One read 1:07 – the time since the 8 a.m. gun went off with the first corral group. The other read 47 minutes and change… but I knew that couldn’t be right. My iPhone app told me I had finished in 54:25. Which I was super happy with, as it was over 3 minutes better than my previous 10k PB. According to my chip time online, I finished the race in 47:30, but seriously, this is just ridiculous. Not sure what happened there, Sporting Life. Anyway, after a looong walk through the finisher’s corral, I bumped into Elaine and we walked around the gigantic finish area, trying to locate water, food, and friends. 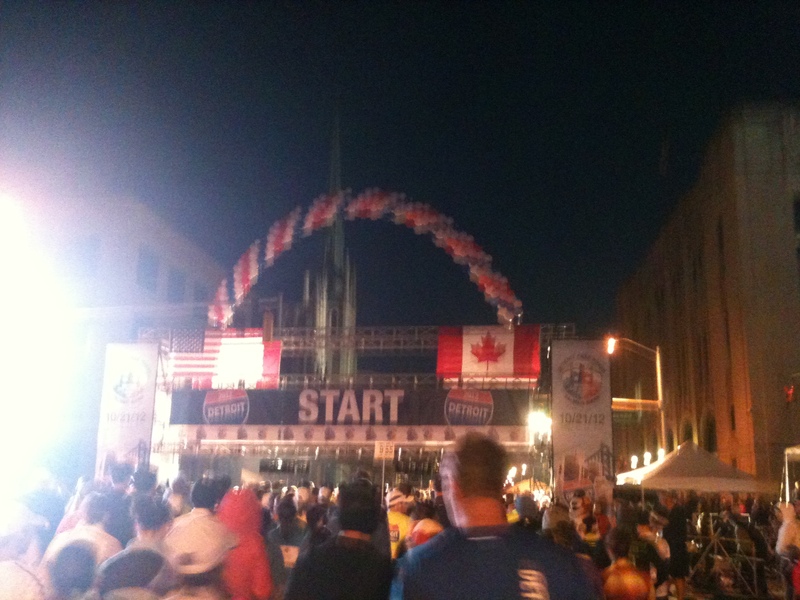 With 20,000 or so runners, you can imagine how insane this process was. 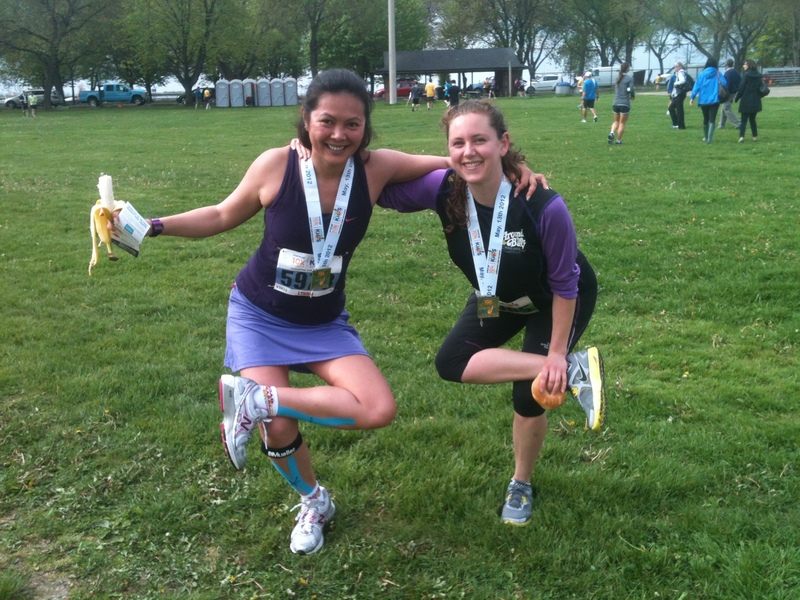 Eventually, we found Lynne and took a few celebratory photos, amidst a much needed stretching session…. Then slowly made our way back up to the starting line where we had parked. I headed home, grabbed a quick bite to eat, changed into my yellow race shirt, and headed out for another 10k run (I’m running a half marathon in two weeks and the schedule for today called for 20k). Running “doubles,” or running twice in one day, is not something I would suggest doing all the time. But I find that once in a while, it can be helpful when you need to squeeze in a distance that just isn’t doable all at once. I was surprisingly energized throughout my 2nd 10k, which I’m attributing to leftover endorphins from the race. However, when I got home I was absolutely ravenous. My body is used to gorging on brunch food after a race, not nibbling a banana and an energy bar and then going out to burn more calories. Though my legs didn’t feel too sore last night, I feel the need to stay as close as possible to my foam roller today. My quads and IT band are SUPER tight. The downhills feel great in the moment, but they can really put your legs through the ringer. Anyway, despite all the mishaps, I ran a great race and am proud of myself. But that truly wouldn’t have been possible without the support of my friends Lynne and Elaine – thank you SO much ladies! I am dedicating yesterday’s PB to you! *Note: I am now exactly one week behind in my Photo Per Day Challenge. I’m still taking photos and (sometimes) writing every day, but I’ve fallen a bit behind in posting them to the blog. As such, what you’ll see from Day 12 below was actually taken on March 12th, not today. Apologies for my tardiness. This photo was taken during this morning’s run. I was going for casual, but it came out a little “Angelina Jolie at the Oscars,” didn’t it? So I now have a new personal record for longest distance run at once: 25.05 km. On this sunny, spring-like day, I finished my last long training run for Around The Bay, which is just 13 days away. It took me approx. 2 hours and 40 minutes – not sure because using my GPS tracking app for that long while listening to music is impossible and my phone battery died around the 20 km mark. It feels exhilarating to be able to say I ran that far. It was a tough run at times, but I stuck it out and even finished the route with the Avenue Road hill from Davenport to Balmoral. Mentally, I’m glad I did that as there will be some killer hills towards the end of the race. But it also hurts to run that far. A lot. My toes and arches are blistered, my quads and glutes are tight, my left knee hurts (not a good sign) and I feel wiped out in general. I take most of the blame for this – I didn’t run as long or as often as I should have these past few months. I haven’t done nearly enough yoga. But instead of beating myself up over it, I’m going to learn from the experience and make some changes for next time. If running has taught me anything, it’s that life is not about being perfect. It’s about constantly challenging yourself, and growing in the process. And of course, outdoor eating. My favourite kind. A few years ago, I made a new year’s resolution to try one new thing per week. I stuck to it for a good four months until it became less of an intentional goal than a part of my lifestyle. The idea behind that resolution was to reach outside my comfort zone and experience as much as I could. That’s how I try to live my life now. One of the “new things” I tried in that first few months? Going to the movies alone. At some point in my life I had picked up the idea that doing so meant I was sad and lonely, and other people would judge me. It made not one shred of sense – after all, I often shopped alone, went to coffee shops alone, hell, I lived alone! Why all the drama about the movies? So I took myself out on a date one Saturday afternoon. I bought myself a treat. And I picked out the best spot in the house (because I could sit wherever I wanted!). As I waited for the show to start, I noticed I was definitely not alone in my “aloneness” – there were at least a dozen other singles in the theatre. If they can do it, so can I. I still enjoy seeing movies with other people, but from time to time – like today – I’ll go by myself. 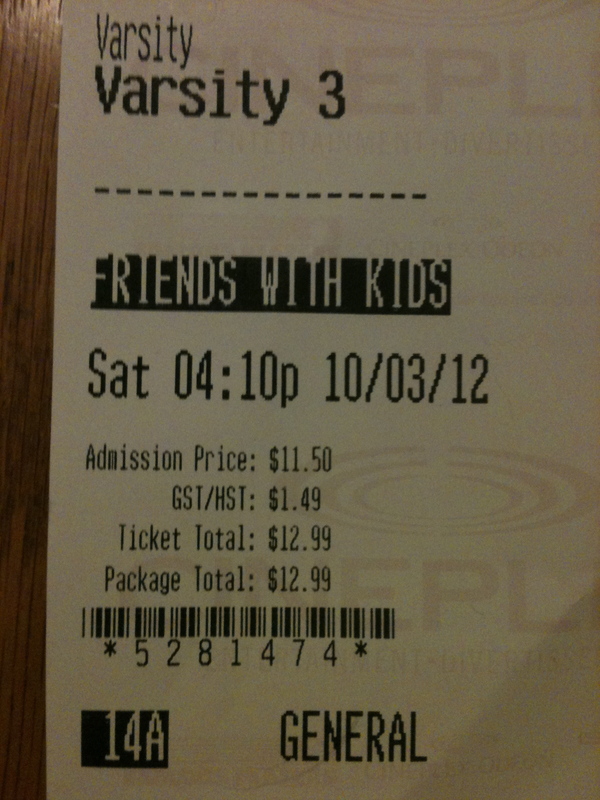 I saw “Friends With Kids,” mostly because it starred half the cast of Bridesmaids. I didn’t laugh as hard – I don’t know if I ever will – but I did laugh. Out loud. In a theatre while by myself. That says something, I think. I’ve lived in my apartment for 3 ½ years. At first, it felt claustrophobically small compared to the spacious two-bedroom I shared with my former roommate, but over time I’ve grown very fond of it. It’s got character – high ceilings, narrow doorways, a faux fireplace, and stained-glass windows. It’s also old. And you know what else tends to live in old buildings? Rodents. They say you learn a lot about yourself when you live alone. I’ve learned that while I’d like to think of myself as an independent woman who can fend for herself, I continue to experience paralyzing fear at the thought of touching a mouse. I’ve been aware that I share my dwellings with mice for quite some time now. On the odd occasion, I’ll glimpse one scurry along the wall in my kitchen. One morning as I went to make breakfast, I noticed a huge chunk missing out of an avocado sitting in a bowl on my counter. That was the end of leaving food in a bowl on the counter. It was inevitable that one day I would have to face the mouse head-on. Well, today was that day. I came home to little Larry (that’s my name for all of them), sitting near my garbage can. At first I thought he was dead. I made loud noises to see if he’d react – he did. Slowly, helplessly, he tried to lift his head and move, but he was stuck. Poisoned by one of my less rodent-tolerable neighbours. I felt his pain – I, too, was stuck. How to deal with this horrible predicament? I sent a frantic text to my friend, with whom I’d been discussing my mouse woes just hours before. Of course, that did nothing to solve my problem. Thinking more strategically, I called my landlord to come remove Larry from the premises. Thankfully, he lives in my building and arrived at my door in mere moments. 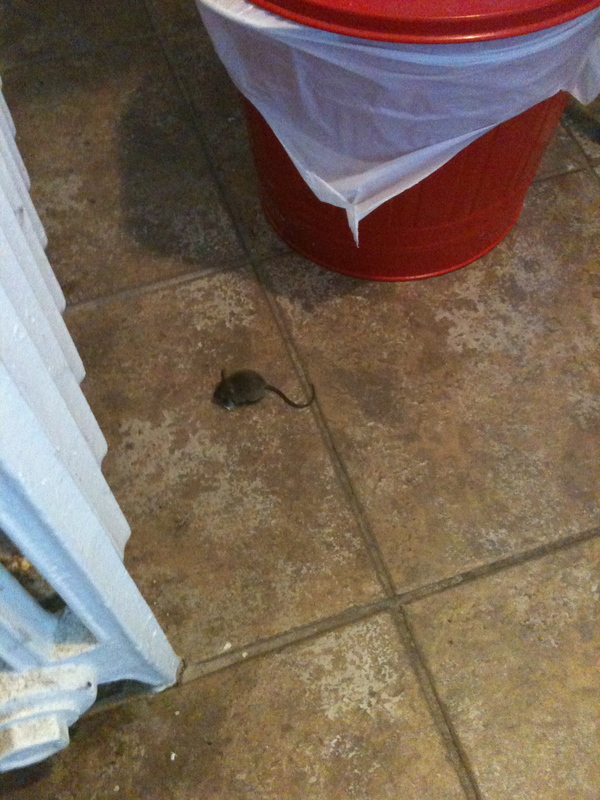 He scooped little Larry up in a plastic bag and I bid him adieu by doing a happy dance in my living room. Here’s hoping Larry’s brothers and sisters find a more private location to meet their tragic ends. Anyone else sensing a trend with the photos in this challenge? If I’ve learned one thing over the past week, it’s that food can be considered a highlight of almost every day of my life! Actually, scratch that, I already knew that. 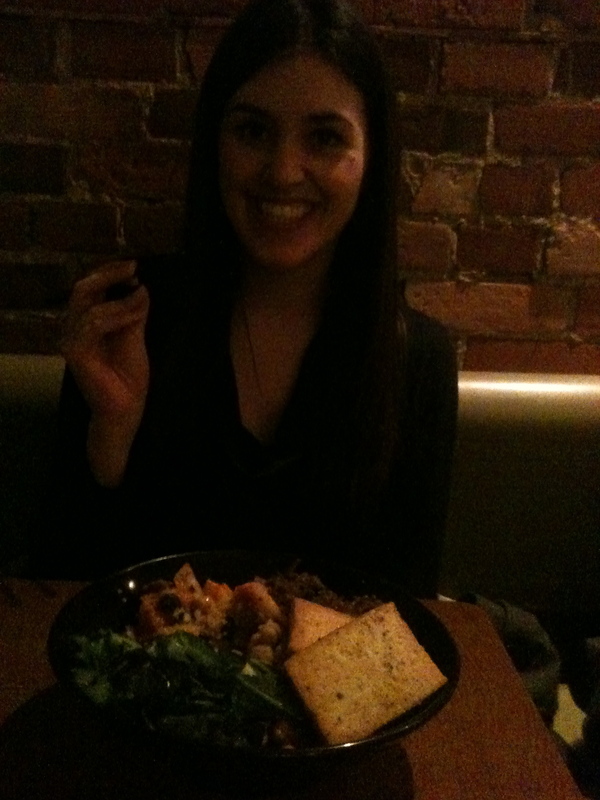 But I digress… this evening I met the lovely Cathy Little for dinner at one of my favourite local spots, Live Food Bar. Not only is the menu full of fresh, raw, local, healthy food, it’s also got tons of gluten-free options, ideal for my friend with the gluten allergy. Cathy and I rarely go a week without seeing each other, but somehow we had let over a month go by without a visit. I guess it’s been pretty hectic around here. We had a lovely meal – albeit with not-so-lovely service – and afterwards popped into a pub down the street for a couple of drinks. A dinner was certainly not going to suffice for the volume of conversation we had to catch up on. p.s. Apologies for the poor photo quality. My iPhone camera doesn’t thrive in restaurant lighting..